Participating undergraduates will get a ‘taste’ of the pharmaceutical industry with respect to development of small molecule inhibitors as potential chemotherapeutics with a focus on early stage drug lead development for cancer treatment. Initiated in 2011 at Texas A&M by Prof. Romo, TAMU MiniPharmers were engaged with synthesis, biological screening and in silico docking experiments with dual inhibitors of two current enzyme targets for cancer, fatty acid synthase and the proteasome.1 Currently, Baylor MiniPharmers are developing novel derivatives of the marine natural product agelastatin A, a protein synthesis inhibitor, with the goal of designing and synthesizing structural variants with improved solubility and potency. Thus, this Project will enable students to gain team-work and leadership skills in addition to experience with synthetic organic chemistry, biological assays, and inhibitor docking in an iterative, collaborative process. Team members will choose from one of the following areas: (1) synthesize novel agelastatin A derivatives in the Romo lab (2) assay these derivatives as inhibitors in the Taube Lab (3) molecular modeling and in silico docking in the Shuford Lab. 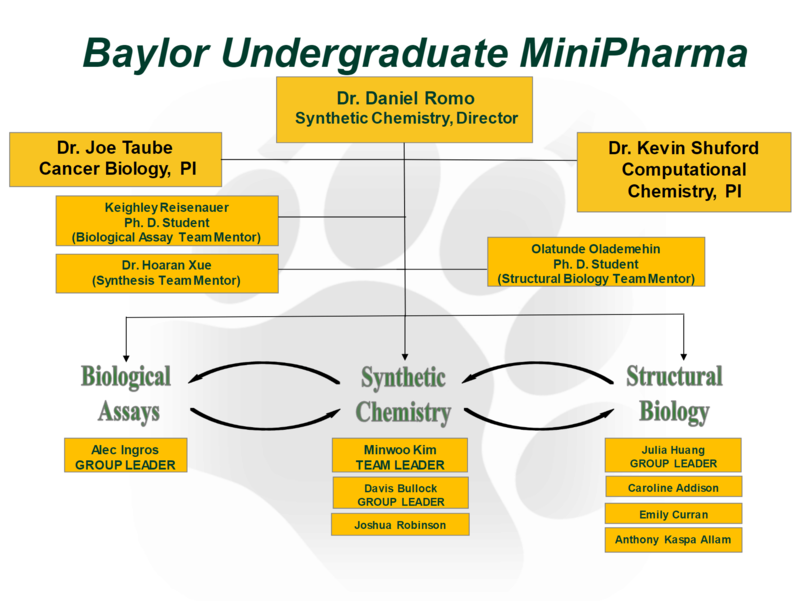 MiniPharmers will be engaged primarily in one area of research in a given semester but will interact with all research groups and have the ability to experience another group in a subsequent semester. The overall goal of the BU Undergraduate MiniPharma, as a somewhat autonomous research team, is to gain teamwork and leadership experience, get a sense of what happens in the pharmaceutical industry while learning new research skills. The MiniPharma Team has regular meetings to analyze and discuss results, plan future work, and develop presentation skills. 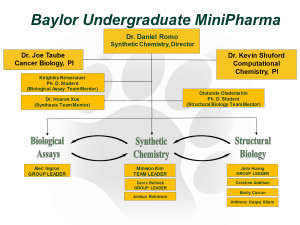 The MiniPharma Team currently consists of a Team Leader, three Group Leaders, several returning MiniPharmers and new members, and three Team Managers (currently a graduate student and two post-doctoral associates), along with three Faculty advisors.